Deepa Iyer is a South Asian American activist, writer, and lawyer. 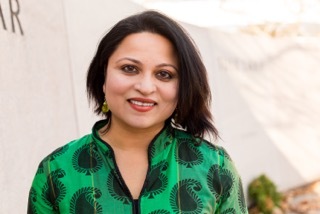 Deepa is currently the Senior Fellow at the Center for Social Inclusion where she provides analysis, commentary and scholarship on equity and solidarity in America’s changing racial landscape. 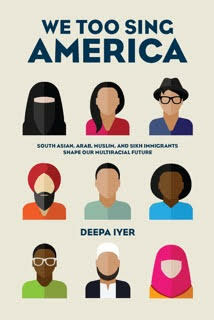 In November 2015, The New Press published Deepa’s first book, We Too Sing America: South Asian, Arab, Muslim and Sikh Immigrants Shape Our Multiracial Future. Scholar Vijay Prashad has written that Deepa “brings the head of a lawyer and the heart of a community activist to bear on her remarkable book…It is a window into the struggles of the margins that allow the mainstream to remain humane.” Information about the #WeTooSingAmerica book tour can be found here. Most recently, Deepa served as the Executive Director of South Asian Americans Leading Together (SAALT). While at SAALT for nearly a decade, Deepa shaped the formation of the National Coalition of South Asian Organizations (NCSO), a network of local South Asian groups, and served as Chair of the National Coalition of Asian Pacific Americans (NCAPA). Deepa’s work on immigrant and civil rights issues began at the Asian American Justice Center in the late 1990s. She also served as Trial Attorney at the Civil Rights Division of the U.S. Department of Justice, where with two other attorneys, she shaped an initiative to address post 9/11 backlash, and as Legal Director of the Asian Pacific American Legal Resource Center (APALRC), where she worked on a multiracial, community-led campaign to pass the DC Language Access Act. Deepa has also taught classes on Asian American movements and South Asian American communities at Columbia University, Hunter College, and the University of Maryland where she served as Activist-in-Residence in the Asian American Studies Program in 2014. Deepa’s opinion editorials on issues ranging from the post 9/11 backlash to immigration reform to anti-Black racism have appeared in The New York Times, The Guardian, Al-Jazeera America, and The Nation. Why is it important for Sikh Americans to read We Too Sing America? Can you tell us the central focus of your book? movements for justice even as they confront significant forms of “othering” – whether it is through law and policy, through public actions, or through misleading media narratives. I hope that Sikh Americans, and all readers, will be so inspired by the courage of the young activists in the book that they too will take action to shape communities that are safe and welcoming for everyone. What similarities do you see in all these hate crimes against different religions? South Asian, Muslim, Arab, Hindu and Sikh immigrants have long faced hate violence in the United States, often because we are seen as “others” and as scapegoats for economic or national security dilemmas that the nation faces. In the post 9/11 environment, we saw disproportionate levels of assaults and even murders targeting these communities because they were seen as terrorists. Over the past 14 years, places of worship have increasingly become vulnerable to hate violence, as was the case with the horrific massacre at the Oak Creek gurdwara in August 2012. Simultaneously, community groups have come together to press for changes in policy and practice to address and deter hate crimes. Do you believe the upcoming presidential elections will change anything? While elected officials comprise a critical component of American democracy, it is even more vital that we build the power of the people to create long-lasting, transformative changes. That includes raising awareness and mobilizing new voters and citizens-in-waiting around issues of importance during election season. It includes being in a state of readiness to hold elected leaders accountable to our issues. It means that our communities are able to present a slate of policy recommendations to those running for elected office. The Black Lives Matter network has been engaging on this level recently, and I think that there are lessons for our own communities about how to strategically apply pressure on political parties and candidates. How effective is the Sikh American response of establishing peace amongst communities? Is it working? How and why? In my work at South Asian Americans Leading Together (SAALT), we regularly engaged with three national Sikh groups: the Sikh Coalition, the Sikh American Legal Defense and Education Fund, and UNITED SIKHS. Each of these groups engages in interfaith and coalition work on issues ranging from hate violence to profiling. The groups have also been very consistent about reframing any messages from community members that “Sikhs are not Muslims” in response to hate violence in post 9/11 America. Instead, these groups make it clear that we should not tolerate hate violence against any communities, and that an act of hate against one community affects all of us. What measures should be taken to create a more inclusive and racially and faith accepting society? In my book, I document many examples undertaken by organizations and activists to build inclusive and equitable classrooms, workplaces, and communities. For South Asian communities in particular, we must have conversations about race with our families and friends, and often, I’ve found that these are some of the hardest conversations to have. We must also decline the racial bribe, which is an invitation to climb the racial ladder which positions Whites on top and Blacks on the bottom. Instead, our focus must be on dismantling the ladder altogether by rejecting narratives such as the model minority myth that create wedges between communities of color. Young people in particular have the opportunity to generate race talks through student organizations on campus. Each of us can play a role in our own lives to address systemic inequity – yes, the problems seem insurmountable, but the journey to overcome them starts with small actions by each of us. What are you doing to change your student’s perceptions at University of Maryland? At the University of Maryland, we have a large Asian American student population that has the opportunity to take classes through a terrific Asian American Studies program that is connected to community activists and leaders. In the classes I teach, I focus on filling in gaps in knowledge that many college students have about Asian Americans including the effects of post 9/11 policies. I also strive to include community ethnographic exercises in classes so that students can connect more directly with the communities that live around us. And lastly, I try to instill practices and methods of critical analyses with my students so that they are able to form opinions and take actions on issues that matter most to them. It is clear you have done deep research into race relations, how do you keep a positive attitude and mindset in the face of such hate and violence in our communities? What gives you hope? The young people I document in my book give me hope. They are resilient in the face of tremendous challenges. For example, Yves Gomes is an undocumented man who has consistently spoken up for the rights of immigrants and people of color more broadly. Both his parents were deported and Yves himself had to fight an order of deportation against him. When I feel tired or overcome by the challenges in front of us, I think about people like Yves, or Drost, or Faiza, who are also profiled in the book. They inspire me to keep on walking. Her Name Is Kaur has now been released!